Want the look and feel of brick or cobblestone, without the drawbacks? Decorative asphalt is pavement that has been imprinted and colored, taking on the appearance of brick, cobblestone, or any other decorative rock or brick surface. Decorative Asphalt is a pavement texturing process designed to replicate the classic look of brick or cobblestone, without the headaches associated with traditional pavers. It can be installed very quickly with little disruption. Decorative Asphalt provides all of the visual interest and architecture for a fraction of the cost of traditional pavers. This seamless application prevents the growth of vegetation and the penetration of water, giving a virtually maintenance-free decorative pavement. Decorative Asphalt can be installed on new and existing asphalt (less than 3 years old). The process involves heating the asphlt and then imprinting it with special metal templates to produce the desired texture and pattern, followed by several coats of high quality traffic coating in the desired color(s). If a portion of the decorative pavement does need repair or replacement for any reason, new asphalt can be installed, printed and colored to match. This makes the patch virtually undetectable to the eye. There are many patterns and colors to choose from, or you can design you own custom look and color. Decorative Asphalt is a flexible pavement that makes it resistant to cracking and eliminates the need for expansion joints compared with concrete. Decorative Asphalt is a continuous, waterproof surface that resists weed growth and inhibits the migration of water to the base, thereby reducing the possibility of base failures due to erosion. Decorative Asphalt is easily repairable and has low maintenance costs. Decorative Asphalt can be installed very quickly (as much as 10 times faster than traditional pavers) resulting in much less disruption to traffic. Decorative Asphalt makes it practical to create embossed artwork in the surface. This can be done quickly and easily and creates a whole new opportunity for decorative pavement designers. 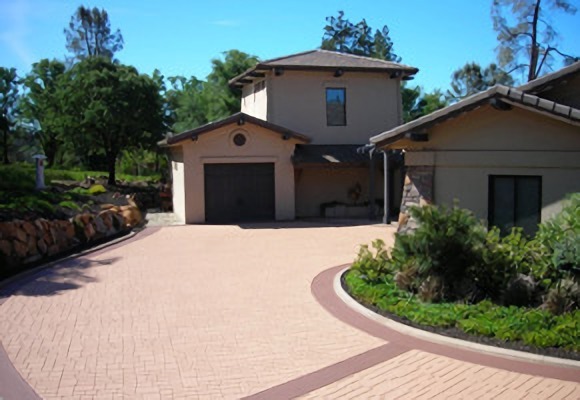 Why use Decorative Asphalt as an alternative to concrete or brick pavers? Decorative Asphalt can be installed very quickly with relatively little disruption, so it is usually much less costly and disruptive than concrete alternatives. Decorative Asphalt uses asphalt as its base. Asphalt is a flexible surface that is more likely to accept shifting due to weather extremes and can resist cracking commonly associated with other paving systems. Vehicle braking, accelerating and steering will not shift or break Decorative Asphalt – this often happens with brick pavers. Decorative Asphalt is very easy to patch and repairs are virtually invisible.